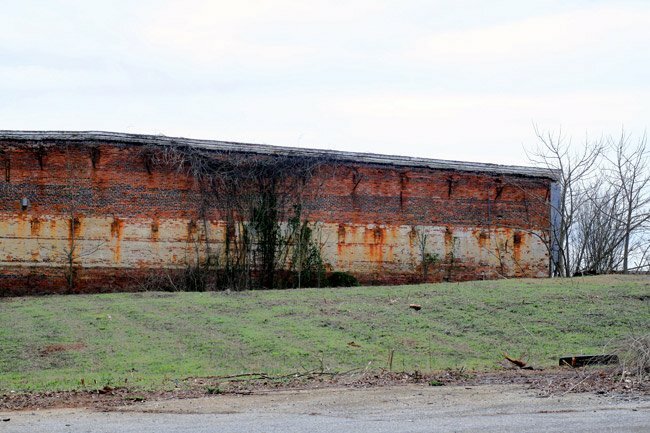 Remnants of cotton warehouses that once belonged to the Pelzer Manufacturing Company’s Lower Mill serve as a reminder of one of the state’s most successful textile companies. Built along the Saluda River, Pelzer Mill actually consisted of four separate cotton mills built between 1881 and 1895. The manufacturing company was founded in 1880 by Captain Ellison A. Smyth, Francis J. Pelzer, and William Lebby. The first three cotton mills were constructed along the river between 1881 and 1890 and were connected to each other. They were collectively known as the Lower Mill. The Lower Mill was dependent on hydraulic power, which used the river’s flow to turn water wheels and generate energy. The fourth mill was an example of industrial innovation and was built in 1895 four miles up from Lower Mill. Called the Upper Mill, it was the first cotton mill in the United States to use a transmission cable to supply the mill with electricity. This system allowed the mill to be built on a hill and thus remain safe from flooding, a common problem for many South Carolina mills situated on riverbanks. The Upper Mill cotton warehouse is pictured below. Columbia Mills, now the South Carolina State Museum in Columbia, was completed in 1894 and was the world’s first textile mill to be operated by electricity. The electricity was supplied by a hydroelectric power plant at the adjacent Columbia Canal, which connected to 17 65-horsepower motors inside the mill via an underground conduit of planking. However, the Pelzer Mill is the first to have had hydroelectric power transmitted from a distance through cable lines. The Boston engineering firm Lockwood, Greene and Company designed both Columbia Mills and the Pelzer Upper Mill. When the Upper Mill began operations in 1896, it was the United State’s largest mill housed in a single building. It was also the first mill in the country to use incandescent lighting. One factor that made textile mills during this era so productive was the use of child labor. 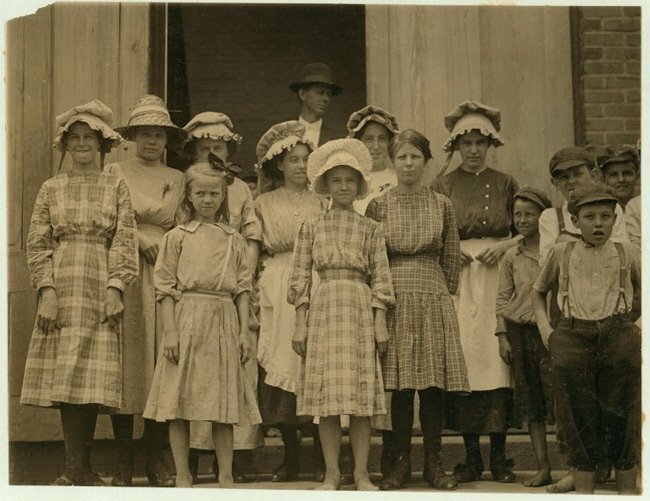 Above, child workers, many believed to be younger than age 12, pose for a photo at the Pelzer Mill. In southern textile mills, children comprised a quarter of the workforce from the years 1880 through 1910. Child labor reform would not come until 1938 with the passage of the Fair Labor Standards Act, prohibiting children under the age of 16 from working in manufacturing plants and mines. According to the Smithsonian National Museum of American History, another ethically dubious practice of Pelzer Mill and other textile plants was the trading of cloth for elephant tusks, which were then sold by the mills to manufacturers of piano keys. The textile mill changed hands throughout the twentieth century before coming under the ownership of Gerber Products Company in 1986. 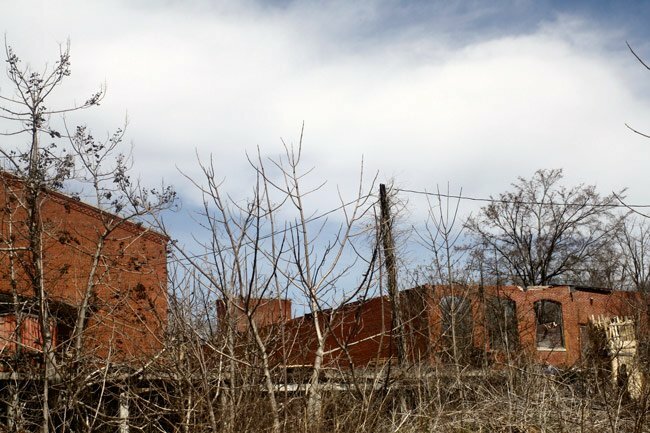 Gerber shut down operations in Pelzer in the late 1990s, and the site was purchased by Utah-based Greenlight Enterprises, LLC, which demolished the former mill in 2004 and has since has been an absentee owner. The former cotton warehouses remained, and the Carolina Pallet Company utilized the space until a fire, which stared in a barrel of burning pallet scraps, destroyed two buildings in April of 2012. Sadly, another fire struck the same location two years later. The Pelzer Manufacturing Company and Mill Village Historic District, located in the Town of Pelzer in Anderson County, was listed in the National Register October 10, 2017. The historic district constitutes the heart of the original Pelzer Mill Village, which was developed along with Pelzer Mill Number One beginning in 1881. The Pelzer Manufacturing Company Historic District served as a supporting village to Pelzer Manufacturing Company Mills Numbers One, Two, Three, and Four. The district contains an array of mill worker housing, as well as larger residential homes, which were used as supervisor housing. It also includes institutional and commercial buildings, many of which were originally built and owned by the mill company. The district is listed at the local level of significance under Criteria A (Industry) and C (Architecture). Although many of the buildings are architecturally modest, the district as a whole represents a significant and distinguishable entity as a rural mill village. The period of significance is 1881, when the Pelzer Manufacturing Company was formed, to 1954 when the Gerber Childrenswear Company (formerly the Kendall Company) sold the houses and property to private individuals and institutions. I am curious how to get in touch with someone about using photos from the site. I am working on a blog about Pelzer Mill and would like to use this photo.